August | 2013 | Stand Up and Speak Out! It’s great to see José enjoy the toys and movies that Jess and I loved growing up. Mom kept most of the books and toys from our childhood. Before Jess left for Colombia, she dug through the boxes of toys and books in Mom’s basement and picked out some for José’s room. His coloring table is a small round table that I used to host tea parties on for my Cabbage Patch Kids and most of my collection of Berenstain Bears books now have a home on his bookshelf. I can’t wait until he’s old enough so we can play with all my old Legos! 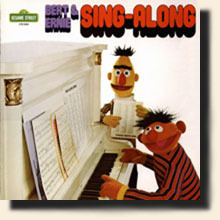 One of Jess and mine’s favorite things was listening to the record Bert and Ernie’s Sing-Along. We would often put on the record player set up in our playroom and sing and dance along to the silly songs. The premise of the record is that Bert is taking a bath when Ernie comes in…with a piano! He wants Bert to participate in his sing-a-long, but Bert just wants to have a nice quiet bath. His bath is anything but quiet as more people and monsters from the Street come into the bathroom. The songs they sing range from classics, like Old McDonald Had a Farm and She’ll Be Coming ‘Round the Mountain, to songs written just for the album, like Living Hand in Hand (my personal favorite). Jess and I would keep ourselves entertained for hours listening to that record. But we grew up and moved out on our own and eventually the record player got packed up. I searched for the record in CD format for years, but to no avail. Maybe at one point it had been recorded onto a tape but even those were a rarity. 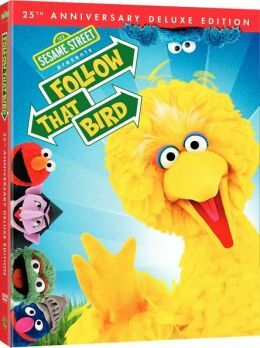 It wasn’t until just a few years ago when I was searching online when I found out that the good people who bring us Sesame Street was going to release the CD, along with two other Sesame Street oldies. I snatched a copy up the day it came out and called Jess. That’s how excited I was and I knew she would be, too. Jess has the copy of the sing-a-long in her car and José asks for certain songs from it. He’s still working on his English, but he’s getting better about it every day and he tries really hard to sing all the words in English. He likes Old McDonald Had a Farm and at the end of the song when the Sesame Street gang slows down and sings, “E-I-E-I-O”, he closes his eyes and deepens his voice. It is both the cutest and funniest thing to see and hear. Another thing that Jess and I loved growing up was the Little Golden Book called There’s a Monster at the End of This Book. It starred none other than Grover. 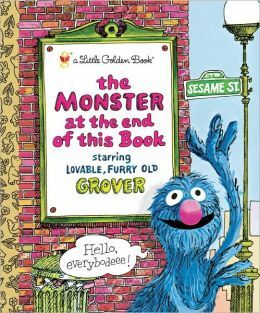 It’s a pretty basic premise: Grover is afraid of the monster at the end of the book and tries to stop the reader from turning the pages of the book. It’s still in print and I am excited when I see parents buying it for their kids. I actually don’t know if José likes the book; I just know that it’s on his bookshelf. Come fly with me in an upside-down world. There’s so many strange things to see. (Bert, talking) Ernie, I don’t feel so good. There’s fish that fall out of the sea. There’s upside-down clocks that make everyone late. It all looks so funny that I’ve got to frown. It’s a fun song to sing, which Jess and I often did. As it turns out, not only does José like the movie, that’s his favorite part of it! It’s probably because it all takes place in an airplane and he loves airplanes, but we often hear him singing the song to himself. Well, we hear him sing the second verse over and over (and over and over) to himself. We even listen to the soundtrack in the car when José asks for it. I love being an aunt and getting to relive my childhood through someone who sees all of it as something new and exciting! *The letter ‘S’ is for singing, silliness, and Sesame Street.